With all precincts reporting, but thousands of provisional ballots left uncounted, Kobach led Gov. Jeff Colyer by just 191 votes as of Wednesday morning. 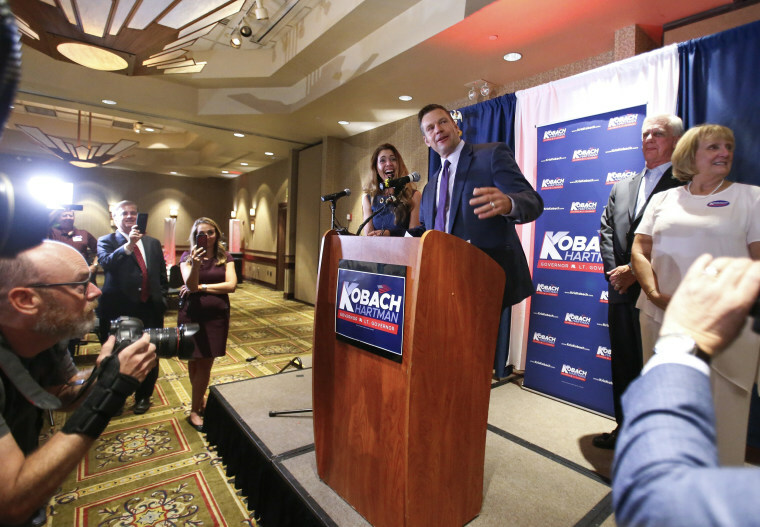 Kansas Secretary of State Kris Kobach, a Republican endorsed by President Donald Trump, narrowly leads incumbent GOP Gov. Jeff Colyer by just 191 votes in Tuesday's gubernatorial primary. As of Wednesday morning, there were between 8,000 and 10,000 provisional ballots left to be counted, said Bryan Caskey, Kansas' state director of elections. Caskey said those ballots wouldn't be counted until Monday, at the earliest, when county officials begin meeting to certify election results. Caskey said it wasn't yet clear how many mail-in ballots there were that were postmarked Tuesday. There is no automatic recount rule in Kansas. Rather, any candidate can request a recount in any one county, in any number of counties, or statewide, as long as their campaign puts up a bond to cover the cost. As Kansas Secretary of State, a position that oversees elections in the state, Kobach would be in charge of any recount effort, unless he recused himself. Trump endorsed Kobach in a tweet on Monday, calling him a "fantastic guy who loves his State and our Country" and is "Strong on Crime, Border & Military." In a statement Wednesday, Colyer said there were problems with the vote count in Johnson County and that he remained "committed" to making sure every provisional and "legal" ballot was counted. "Given the historically close margin of the current tabulation, the presence of thousands of as yet uncounted provisional ballots and the extraordinary problems with the count, particularly in Johnson County, this election remains too close to call," he said. “We are committed to ensuring that every legal vote is counted accurately throughout the canvassing process,” he added. During the race, Colyer attacked Kobach’s record on abortion by pointing to a 2000 local newspaper questionnaire, in which Kobach described his views on abortion as pro-choice when he ran for state Senate, according to The Kansas City Star. Kobach later said he had never been pro-choice, the paper reported.